Olympia OL3020 Info Globe Plus 5.8GHz Cordless Phone. Ladeschale Netzteil. · Erweiterungshandgerät mit Ladeschale. ohne Ladeschale zum Verkauf. · Anschlüsse: 2,5 mm-Klinkenanschluss. KEDU KOA7 400V Maschinenschalter mit 80cm Kabel,Phasenwender und NOTAUS Funktion. Lighted keypads and large, lighted displays on the AT&T EL52203 cordless phone make viewing and dialing easy. 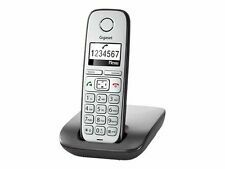 Expandable phone system features a base station with digital answering system, plus 2 cordless handsets and is expandable up to 5 handsets. 2x Uniden D1660 6.0 Cordless Phone Handset and Charging Base Expansion Base. Condition is Used. Shipped with USPS First Class Package. 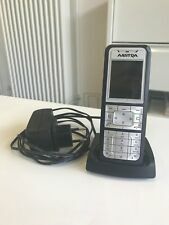 Panasonic KXTGFA30M 1.9 GHz Single Line Cordless Phone, 2 complete phones VG. Condition are Manufacturer refurbished,that were never used after purchased. These are for KX-TGF382M base system. Shipped with USPS Parcel Select Ground. BT 6600 (BT6600) Advanced Call Blocker Handset & Charger - SEE ITEM DESCRIPTION! TO A EXISTING BT 6600 BASE. Colour screen. TO A EXISTING BT PREMIUM PHONE BASE. Handsfree speaker. 1.8" Colour Screen. NEW! Panasonic KX-TGL432R DECT 6.0 Cordless Phone with Answering Machine - Red. Condition is New. Shipped with USPS Priority Mail. N o manual in box. NEW PANASONIC CORDLESS ANSWERING SYSTEM. ALL THE BEST FROM OUR FAMILY TO YOURS. MIKE, SHERI, AND NICK. THE BOX HAS BEEN OPENED, THE CONTENTS ARE NEW, COMPLETE AND TESTED. With a 3-way conference capability, this two-line cordless phone allows you to take part in group chats. Featuring the ‘any key’ answer system, the Panasonic KX-TG9321T phone lets you easily answer a call, by instantly hitting on any of its buttons. Panasonic KX-TG5432 Cordless Phone & Answering Machine System, Manual Included . Condition is Used. International buyers must use Ebay global shipping program. VTech two handset cordless phone system. System has been tested and works. Do not disturb mode - switches ringer off, except for selected numbers (1). 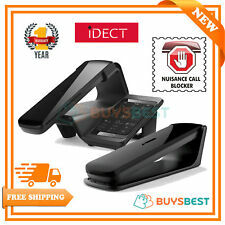 BT 6600 Advanced Call Blocker. Record your own greeting of choose one of BT's. One touch block button. Call waiting, see who's calling and easily switch between calls (1). BT Diverse 7110 Plus. BT Services button. Handset power on/off. Handset naming feature. Find handset feature. A User Guide when available, PDF files, when not. GAP compatible. AT&T CORDLESS PHONE E1127B With Charging Base And Power Cord. Condition is Used. Tested and works great. Handset ONLY! No battery just the handset. Panasonic KX-TG4731B Expandable Phone System Answering Machine DECT6.0. Tested and working. Used condition. Items are in excellent used condition. They've been fully tested and function properly. See photos for better cosmetic description. This is for a handset only without a battery. No base, battery, etc. included. Item has been deregistered from base for ease of registration upon receipt. FACTORY SEALED, NEW OPEN BOX, REFURBISHED = Tested for Full Functions, R2/Ready for Reuse. Access Point (1). Hard Drive (10). Tape Drive (2). PREVIOUSLY OWNED, TESTED FOR KEY FUNCTIONS = Tested for Key Functions, R2/Ready for Resale. Bang & Olufsen Home/Office Phone Beocom 1600 Black Telephone Vintage 1990s. Condition is Used. Shipped with USPS Priority Medium Flat Rate Mail. In great condition. Everything works, the ringer, buttons, no problems. VTech Digital Answering Service Silver Corded Phone Model cs6649 Cordless Phone. Comes with cords and cable. Tested and working. Note tested for power only. Both sets in very good condition cosmetically. Expand your landline phone system. Works with the following Panasonic phone systems: - TGE210/TGE230/TGE240/TGE270 Includes handset, cradle/charger, batteries, and AC adapter (plug). Batteries still hold a charge but not sure how long. Additional cordless handset – Not a standalone product. Good pre-owned condition with minor wear. Please see pictures for details. 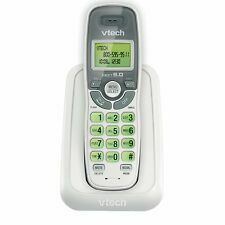 Vtech DS6722-3 HS FREE. Battery not included. Panasonic cordless phone system KX-TG9541B Link2Cell Bluetooth Enabled 2-Line Answering System. 1 handset with base unit. Unit is expandable up to 6 handsets. Condition is Used. Shipped with USPS Priority Mail. The Polycom CX300 desktop phone was designed to be used as a regular handset. Like a traditional phone. High definition audio for best possible voice and video calls. Plug and play operation to a USB port on the PC Superior voice quality. 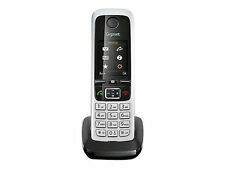 Unify Openscape DECT SL5 mit Ladeschale, Akku,Clip - wie SL450. Netzteil 230V. Wir kaufen Ihre alten Endgeräte an! KEDU KOA7 400V Maschinenschalter mit 80cm Kabel,Phasenwender und NOTAUS Funktion. Gleiche Kategorie. Included 1 base with a total of 3 handsets. Voice Paging Yes. Handset Speakerphone Yes (7-step). Expandable Up to 6 Handsets. Intercom (Handset to Handset/Handset to Base) Yes (Base Unit/ Cordless Handset).